The French SPOT satellite data (20-m resolution) were obtained on 28 July 1989 and provides a view of the mapped region from space. The false-color infrared image shows more densely vegetated areas as brighter red tones. 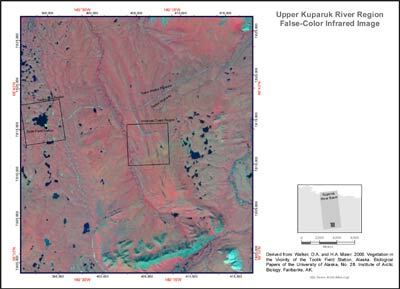 When compared with the glacial geology map, the older Sagavanirktok-age glacial landscapes have few lakes and redder tones indicating more dense vegetation, and the younger Itkillik-age glacial surfaces that have more lakes and grayer colors. The image data were also used to produce the NDVI/biomass map.